The IRC is celebrating the freedom to read this week during the 30th anniversary of Banned Books Week. Jean Evans and students Daniel Collins, Monica Kim, Simona Stancov and Leon Wang, have set up a display of books that were banned or challenged around the country during the past year. “Ever since books have been printed, people have been trying to get books out of the hands of others.” said Ms. Evans. 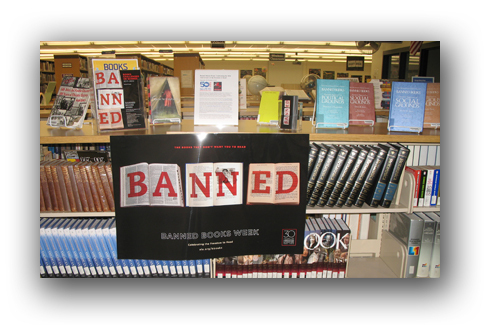 To set up the Banned Books display, Ms. Evans and the students consulted the American Library Association guide to decide which books they wanted to display that had been recently challenged or banned. The guide is printed each year and is a part of the IRC display. To read about all the books that have been challenged or banned, see the American Library Assoc. guide or any of the books on display that list the challenged or banned books by category. Join the IRC staff as we celebrate the free and open access to information during Banned Books Week. Check out a banned or challenged book today! This entry was posted in Displays on September 30, 2012 by jean.